At the end of the year 2012, the paper "Secure stadium experience" was introduced into German football. While this package of measures is into its second season now, we would like to see how our European neighbours handle the topic of security in football. For the start of this series, we took a look at Austria, Turkey, the Netherlands and Sweden. In this text, we set our eyes on how things are in France. 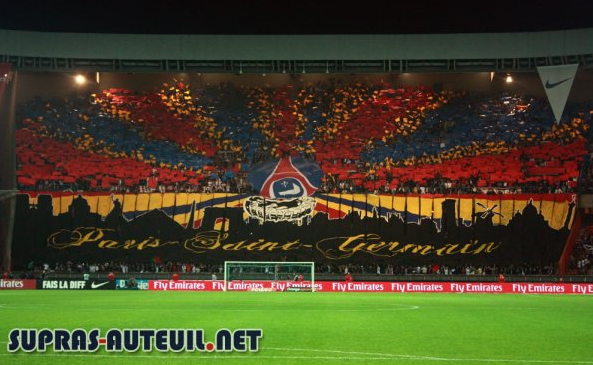 Ultra’s movement death in Paris and maybe also a lack of newcomers in the main Ultra’ groups whilst others took the decision of a self-dissolution are many explanations to less and less craziness in the stands and more “sanitized” atmospheres. 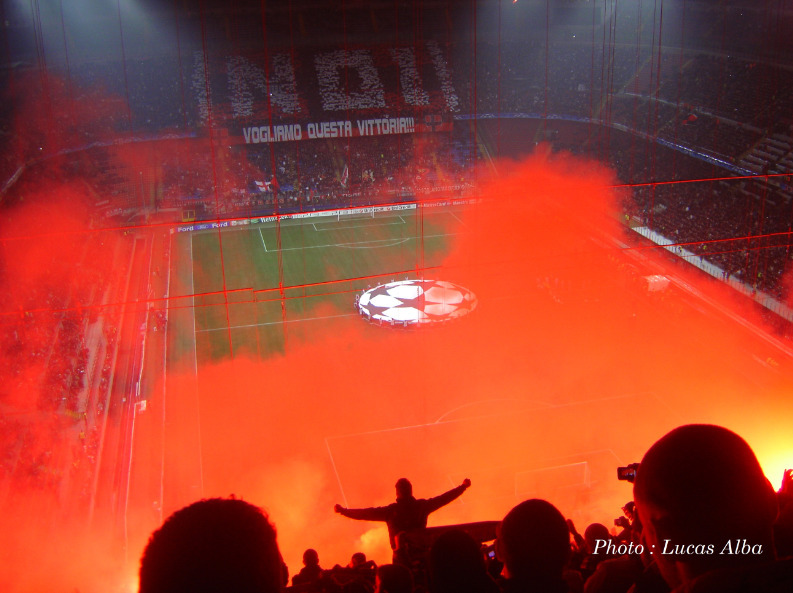 A dozen of years ago, you could see very frequently flares or torches in stadiums but also smoke bomb, banners towards rivals and tifos all the time in French stadiums. Stating this is not really the case anymore would be an understatement. The ticket prices increase needs to be taken in consideration too, and especially in Paris, where you have to pay at least 35€ to be in the away stand (it’s more expensive if you are among big team fans). Lille increased their prices too since the built of the new stadium. There used to be a time where all clubs agreed on a single price for away fans, which was 8€ (sometimes 5€). This time is far behind. Restrictions are different according to where you are going to and who you are. For big games, fans are taken in charge a few dozens of kilometers away from the city where the match is (Marseille fans going to Saint-Etienne or Paris for example). There can be new regulations due to new stadiums too, such as in Lille, where you cannot bring everything anymore and you can be facing the dilemma to take with you either a drum or a megaphone for example, as well as remaining close to the stadium and not going into town. Apart from that, you are quite free to go in town for other games considered with no potential risks. The same goes in lower divisions, where you are quite free unless it is a derby day or big game. Ultra’ groups in amateur levels can enjoy the freedom of a grassroots football:villages, grounds without stands, possibility to have a drink and see spectators stunned by an atmosphere they are not necessarily used to. Ultra’ groups find their pleasure in different ways according to the team they support. Big team ones can find it in vocal (and sometimes physical) rivalries whilst the ones from lower leagues can find it in other ways. This is why French Cup is particularly appreciated by the fans: it is the opportunity for big set of fans to go to small places they would never usually go to, when small clubs ones can discover big stadiums and tensions. Football Authorities seem to only believe in repression. There is no much room for dialog. In their eyes, football is a commercial item where supporters are consumers and do not expect them to protest in any way. They only expect football fans to pay for their ticket to enjoy the show, end of story. So the problem here is the difference of football’s perception: consumerism for ones, with fans seen as customers only, and supporters as part of the club’s life, not only watching a football game for the others. Taking it from there, the gap seems to be impossible to reseal. However, maybe a dialog has started in the past recent months. First, a National Supporters Council was born from a conference which took place in the Senate. This Council focuses on football supporters’ integration in football authorities and the development of supporter shareholdings. Also, many Ultra’ groups signed an open letter addressed to the Sports Minister and her Secretary of State for Sports, who highlighted the urgency to start a dialog with supporters. Relationships between the fans and the Police are also tensed, and it seems like it has now reached the point of no return. It is frequent to see both sides facing up. This antagonism is not inherent to main groups of supporters (Marseille, Saint-Etienne and Paris) but everywhere in every division in French football. There have been serious troubles last February during a game between Nîmes and Le Havre in Stade Océane (Le Havre). After full-time whistle, the police started to attack when Nîmes supporters were leaving the stadium. Supporters were agitated because of the euphoria generated by the game and by the trip, but this agitation didn’t require such polie’s fierceness. The Old Bill used their truncheons very vehemently on Nîmes’ Ultra group “Gladiators”, but also on families. 14 years-old teenagers were hurt, two ultras were knocked-out and another one saw his arm broken. 6 months later, he still has not been back to work because of it. This type of troubles has been occurring often enough in stadiums in the past few years and has been increasing again last season. Fans are obviously sometimes the ones generating violence, but the problem there is: for Medias, authorities and hence inexorably public opinion, supporters are always the source of the problem. Police never question themselves about the methods used towards supporters and they are always protected, no matter what happens. There is a real football supporter’s demonization and question is dealt in a Manichean way. But it is obviously a little bit more complex than that and responsibilities could be shared more often than told. To emphasize a bit more the absence of dialog until now between fans and authorities, there is no tolerance at all about pyros. More than the fine received by the club, everyone caught using a flare will be facing a stadium ban, a fine and might even see his supporter’s group punished as well. Fans asked several times for leniency towards it but there has been no answer so far. Special and secured zones (like in Scandinavia) where you could use pyros have been suggested but nothing so far. Flares and torches are the symbol of supporters’ disobedience and authorities are not inclined to show they are losing the face in any way. Hence, the use of pyros is legally perceived as hooliganism, same as violent acts, and it is the main source of stadium bans. French football had its fair share of violence. It is quite difficult to give off only one type of violence due to our country’s cultural diversity. According to the different areas and clubs, the type of supporterism and hence violence can be different. Ultra’ movement is well settled particularly in South of France with the likes of Nice, Marseille, Montpellier, Bordeaux or even Toulon in the lower divisions, and violence resulting from this movement is not always organized. If Ultra’ movement is everywhere in the country, there are places where violence is more linked to Casual movement such as Nancy, Lille or Paris. You can regularly find both movements in one club for example in Nantes, Saint-Etienne or Lyon. However, there are a lot less skirmishes and fights than before, the turning point being 2010 and a game between PSG and Marseille in Paris, where a Parisian fan was killed by other Parisian fans following a latent strife. This was Ultra’ movement’s death knell in Paris and repression has only increased since, not only in Paris but throughout the whole country. In some ways, it is our Hillsborough since it has been the start of massive measures taken in France, a bit like in England when the drama happened in 1989. There is no Ultra’ group anymore in Paris. Also, if fights less and less occur in France, some hooligans do not hesitate to cross the border to go and have some fun, for the ones living close to Belgium or Germany for example. Let’s have a word about the average football fans, meaning neither Ultras nor VIP; it is quite rare to see them attacked, and the rare times it happened was a long time ago. France is a very safe country when football is involved and they surely can go to the stadium with no sorts of problems. There is enough police to ensure anyone’s safety and they can enjoy the game. They are treated and taken in charge the same way as others on their away trips, probably with a little less vehemence from the authorities though. In our country, the difference in a big game and a normal game clearly lies in the police number and how ready they are to act after the first spark. However, a game classified as a “high-risks” game is less and less significant than before. For example, every PSG game is classified as a “high-risk” one since 2010. Also, authorities seem to have found the ultimate weapon to prevent risks by forbidding away fans from some games, in and out the stadium where the match is taking place in. This is allowed via prefectural orders and is quite an issue regarding people’s freedom. This season has seen both games between Lyon and Saint-Etienne, Nice and Bastia or Metz and Nancy without away fans. Should it keep going that way, there will soon be no interesting games anymore fanwise. French football is at a turning point, where active supporters and Ultras don’t seem to be welcome anymore. About the writers: Crazy about football since the childhood and at least as much in supporter’s way of life, I’ve been part of an Ultra’ group for around fifteen years. I also lived for a few years in the UK, which is one of my favorite scenes. Please also note the huge contribution of Guillaume, a very active Nimes’ supporter and part of Gladiators Nimes Ultra’ group. He has been part of his Ultra’ group for 10 years and his club is in second division.